When it comes to your baby’s development, it’s understandable you want to do whatever you can to help. There are a lot of products out there designed to aid during major development milestones from teething rings to educational toys and books. 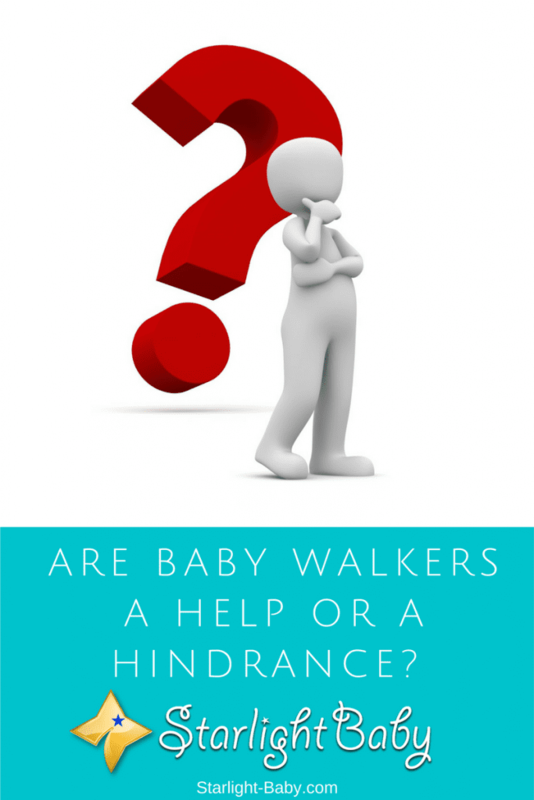 However, while it’s natural to assume all products aimed at aiding in a baby’s development would be safe to use, there’s one product which many experts advise against and that’s the baby walker. In fact, some physiotherapists believe baby walkers are so dangerous for a baby’s development, that they should be totally banned. If you’ve been thinking of getting a walker for your little one, here you’ll discover everything you need to know about the safety concerns and whether it’s a good idea to buy one. If you’re a first-time parent, you may not yet be familiar with what a baby walker actually is. Basically, they tend to have wheels, a small table, and a handle for babies to hold onto. They also often have numerous fun toys built into them to help keep baby distracted and entertained. There’s a wide range available and babies typically love using them. They are designed to help teach baby to walk in a fun and easy way. All the top baby stores sell them which begs the question – why would they stock them if they aren’t safe? The first one is probably the most surprising. After all, baby walkers are designed to aid with walking development. Now, some of them do help and many parents swear by them. However, specific types of walkers don’t encourage actual walking. Instead, they cause baby to start walking on tiptoes. This style of walking can lead to the development of what is known as “bow legs”. However, a lot of parents have given walkers to their little ones and they haven’t had any issues. Perhaps the main concern is the risk of injury. Thousands of babies are injured each year in walker related incidents. Manufacturers have started to address the risks posed however by making walkers wider for example, to prevent baby fitting through doorways. While this has minimized the risk, it hasn’t eliminated the potential for injury. Babies can move around surprisingly quickly with the aid of a walker, making it easier for you to miss potential dangers. Walkers can also tip over, leading to injuries caused by falls. Finally, another concern is they can impact visual skills. If your little one uses the walker a lot, they will become used to the walker stopping them from hitting objects. For example, if they head directly towards the wall, the walker will simply hit the wall and stop baby injuring themselves. So, when they start walking without the aid of a walker, they won’t be as aware of the things around them, increasing the chance of injury. Are All Baby Walkers Dangerous? It is worth pointing out that some baby walkers are safer than others. Push-along walkers are generally safer in terms of development as they encourage baby to walk with limited support, therefore building up the leg muscles. The walkers with an incorporated seat are the ones which can mainly lead to developmental issues, though largely it depends upon how long they are used for. In terms of injury, all walkers can pose some danger. For this reason, all manufacturers provide safety guidelines which should be followed. Provided you take notice of these guidelines your little one should be safe. So, it’s not so much that walkers are dangerous, it’s how they are used which presents most of the problems. As with anything, it’s best to consult an expert to see what they recommend. Use them for a short period of time – One of the best ways to avoid development issues is to ensure your little one only uses the walker for very brief periods of time. Letting them use the walker for 15 minutes every now and again isn’t likely to result in any issues. However, remember this is a very general guideline and advice should be sought from a health professional. Check the guidelines for the specific walker you’ve invested in too as they may mention how long they should be used for. Wait until your baby is old enough – Ideally, you should only allow your baby to start using a walker when they are old enough to place their feet flat on the floor. Be extra vigilant – The majority of baby walker injuries occur because baby wasn’t properly supervised. It’s a common misconception to think you can leave your little one alone in their walker; especially if they are using the strapped in variations. With the aid of the walker your child can move faster, reach objects they wouldn’t normally be able to reach such as chemical cleaners and candles and as they aren’t yet steady on their feet, they could tip over with the walker. So, as they should only be used for very brief periods of time anyway, it’s best to keep a constant eye on them. Only use them on smooth surfaces – Due to the risk the walker could tip over easily, it’s recommended you only use them on smooth, even surfaces. There should also be no obstructions so be sure to clear the area before you allow your little one to use it. These are just some very basic guidelines. Now you’ve got a general idea of the types of dangers involved with using baby walkers, you can make a wiser decision on whether you want to allow your baby to use them. It’s always worth getting advice from a health professional. Overall, the American Academy of Pediatrics is so concerned over the safety of baby walkers, they have called for a complete ban. However, this has sparked a major debate as thousands of parents have taken to online forums to support the use of walkers. At the end of the day, it is down to you to make a personal choice on whether you are happy to let baby use one. Just remember to be aware of the risks and how to avoid them. When I first read the title I had no idea what these baby walkers are until I read your description. I’ve seen them before! One of my friend’s used one for their daughter when she was still learning to walk properly. It didn’t really seem to hinder her development but I never found it appealing. I am glad that I didn’t buy one now. Especially after reading the opinion of the American Academy of Pediatrics. I trust their judgment when it comes to these extra baby tools that we have available to use. After all, they are the experts and they are educated in these ways. They should know the best even if it doesn’t support the mother’s idea. Some mothers might be using it because it looks like the child is having fun inside it but in reality, she’s exposing them to unnecessary potential risks, like the pediatricians said. I think I will stick to not using a baby walker. Yes, Jane. It’s always good to trust the experts. I didn’t know that baby walkers slow down development and are so dangerous. I have used one for my son for 3-5 months and I was satisfied by it, I thought that a baby walker would improve and make our child start walking alone much faster! It is true that once my son fell and hurt his leg, in rest all was fine! wallet, I didn’t know it either until I’ve read this post. I had my kids use them when they were growing up. Thank God their development was not affected, and I made sure they were under a careful watch when on-board a walker because it could indeed tip over. I am a first-time parent, yet I am already familiar with a baby walker. My sister used a walker for her babies and she advised me not to use walkers. She says walkers hinder the development of baby limbs and later they will have difficulty in walking. Based on my sister’s experience, I can say walkers can actually slow down development. If you place the baby in the walker and leave the baby unattended, they might fall from the walker and get injured. I don’t know about any visual impairment.